V2063. 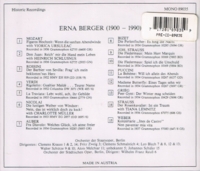 ERNA BERGER: Arias & Scenes (w.Lemnitz, Ursuleac, Müller & Schlusnus) From La Traviata, La Boheme, Ines de Castro, Fra Diavolo, Die Lustigen Weiber von Windsor, Madama Butterfly, Rigoletto, Les Pêcheurs de Perles, Barbiere, Nozze, Don Giovanni, Peer Gynt, Der Rosenkavalier & Die Fledermaus. (Austria) Preiser 89035, recorded 1932-37. Long out-of-print, final copy! "Berger was able to sing well into her 60s with no loss of vocal quality, perhaps because she always sang in a very natural manner and never forced nor abused her voice. Here, her coloratura, with many embellishments, verges on the spectacular. Berger’s singing is…as fluent and natural as a bird’s and always has charm to spare." "The name inseparably associated with the Busch era at Dresden is that of Erna Berger, one of the most astonishing soprano voices in the coloratura range and also a very sensitive Lieder-singer....after Busch, Furtwängler had a special esteem for her, calling her 'a classical singer with a very romantic soul'." "[Berger] was so admired as a personality and as an accomplished singer whose fresh, pearly tone, masterly technique and innate musicality created vocal pleasure and interpretative insights whenever she sang. Everything she does in these pieces sounds so right and inevitable....The recording has us sitting, as it were, in the circle with the voice somewhat distanced." “At a time when many high sopranos offered nothing more than a steam whistle sound, the cool, pure timbre of Erna Berger's instrument fell upon the ears as a balm. Though not large, her instrument had sufficient carrying power to be heard in Europe's largest theaters and not get lost even in the open spaces of the old Metropolitan Opera where she sang briefly beginning in 1949. Trim and petite, she remained a credible stage figure into her fifties and retained to the end of her career the firmness and clarity of tone which had brought her acclaim at an early age. She was an accomplished recitalist and concert singer as well, excelling in the art of German song and such concert works as Beethoven's Ninth Symphony. She trained in Dresden with Melizza Hirzel and, in auditioning for a scholarship, was heard by conductor Fritz Busch who engaged her forthwith. Berger made her opera début at the Dresden Opera in 1925 as the First Boy in DIE ZAUBERFLÖTE. There, she sang numerous roles, many of them in the Italian and French repertories. When she moved on to Berlin, her reputation grew enormously and conductors throughout Europe began to regard her as indispensable for many of the coloratura roles, such as Zerbinetta, the Queen of the Night, and Konstanze. From 1930 to 1933, Berger was engaged at the Bayreuth Festival, her Shepherd in TANNHÄUSER and Woodbird in SIEGFRIED being regarded as definitive. Her Salzburg début came in 1932 when she sang Blondchen in Mozart's DIE ENTFÜHRUNG AUS DEM SERAIL; she continued to sing there until 1954 when her Zerlina still appeared and sounded youthful. On 30 April, 1934, she appeared for the first time on a London stage when her Marzelline, described as "’enchanting’, was heard with Lotte Lehmann, Franz Völker, and Alexander Kipnis. Her Woglinde in DAS RHEINGOLD was likewise praised as was her Woodbird. A return engagement was arranged for the following year and, in 1938, Berger was finally available to perform Konstanze (Sir Thomas Beecham has insisted on her). She also sang the Queen of the Night and Sophie in ROSENKAVALIER. Although her Konstanze was deemed lightweight, it was, according to Francis Toye, ‘technically first rate’. Similar views were expressed about her Queen: well sung, if somewhat lacking the daemonic element. Her Sophie, however, brought no reservations whatever. When Berger returned in 1949, her Queen was more fully appreciated and the public and the critics received both her Sophie and Gilda with unreserved delight. ROSENKAVALIER was the opera in which Berger was introduced to the Metropolitan Opera audience on 21 November, 1949. Described by Irving Kolodin as ‘a wonderfully pure, well-phrased Sophie’, Berger went on to sing other such specialties as Gilda and the Queen of the Night. From composer/critic Virgil Thomson she won this praise: ‘She is one of the great sources of musical satisfaction in our time’."